Poland's Prime Minister Mateusz Morawiecki and Secretary of State for European Affairs, Konrad Szymanski, both from Poland's ruling Law and Justice party, arrive at the EU leaders summit in Brussels, Belgium, Oct. 18, 2018. (by Joanna Plucinska and Tatiana Jancarikova in Bratislava, Reuters) WARSAW/BRATISLAVA (Reuters) – Poland’s government said on Tuesday, Nov. 20 it would join a growing list of mainly ex-Communist European countries planning to reject a U.N. [plan to] regulate migration, as Slovakia’s leader said he also had reservations. Approved in July by all 193 U.N. member nations except the United States, the Global Compact for Safe, Orderly and Regular Migration addresses issues such as how to protect people who migrate, integrate them into new countries or safety return them home. Drafted following the biggest influx of migrants into Europe since World War Two, most fleeing war or poverty in the Middle East and Africa, the pact, which the UN claims is non-binding, is due to be adopted next month by heads of government at a meeting in Morocco. Poland said it would not be endorsing the document. 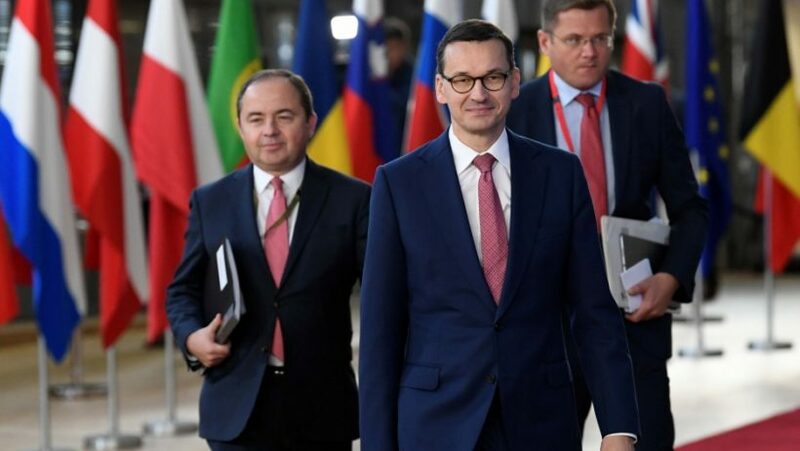 “(It) doesn’t meet Polish demands regarding strong guarantees for countries to have the right to independently decide (who) they choose to accept,” the government in Warsaw said in a statement. Hungary, Czech Republic and Bulgaria have already rejected the pact, and Austria has said it does not plan to adopt it either. In Bratislava, Slovakia’s Prime Minister Peter Pellegrini said he was concerned his country might be required to take in more migrants than it wanted to. “Our red lines are obligations that would limit our sovereignty to decide about accepting migrants,” he told reporters after a government meeting. Published at Reuters on November 20. Reprinted here for educational purposes only. May not be reproduced on other websites without permission from Thomson Reuters. NOTE: Before answering the questions below, read the info under “Background” below. b) What is the UN Global Compact for Safe, Orderly and Regular Migration? c) Why has Poland decided not to sign on to the Global Compact on Migration? d) What did Slovakia’s Prime Minister have to say about his country’s rejection of the UN migrant pact? Soeren Kern at Gatestone Institute wrote in 2017: “Europe’s establishment parties, far from addressing the concerns of ordinary voters, have tried to silence dissent by branding naysayers as xenophobes, Islamophobes and neo-Nazis.” They are also referred to as “far-right” “nationalist” as negative labels. A nationalist is defined by Oxford as: a person who advocates political independence for a country: a person with strong patriotic feelings, especially one who believes in the superiority of their country over others. Why do you think people who put the interests of their own country and borders first are labeled as bad/negative? Explain your answer. Ask a parent the same question.